TRACING® SPORT is an aerosol line marker especially designed for line marking on multisport grass sports fields. This line marker meets the highest standards for quality marking. It is very resistant, and doesn't burn the grass where it is applied. 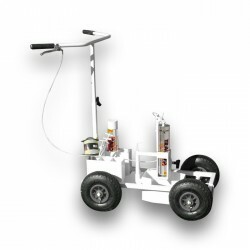 It is used with a marking machine, the TRACING® SPORT TROLLEY, designed for grass sports fields and other applications.